This first map shows the swing on two-candidate-preferred in every seat. I have colour-coded swings for Labor, Liberal, National, Greens and independent, with swings above/below 5% in slightly different colours. Labor is in red/pink, Liberal in blue, Nationals and Greens in different shades of green, and independent in yellow/orange. Seats where there is no calculable swing (including all Shooters seats) are grayed out. You can also toggle this map to show the 2CP margin in each seat (although I’ve grayed out crossbench seats for simplicity). We can first look at the Sydney region, and see that Labor actually gained swings in most seats. But they weren’t big swings, outside a handful of traditional Labor seats in the outer suburbs where it appears that voters who left Labor in 2011 have returned. 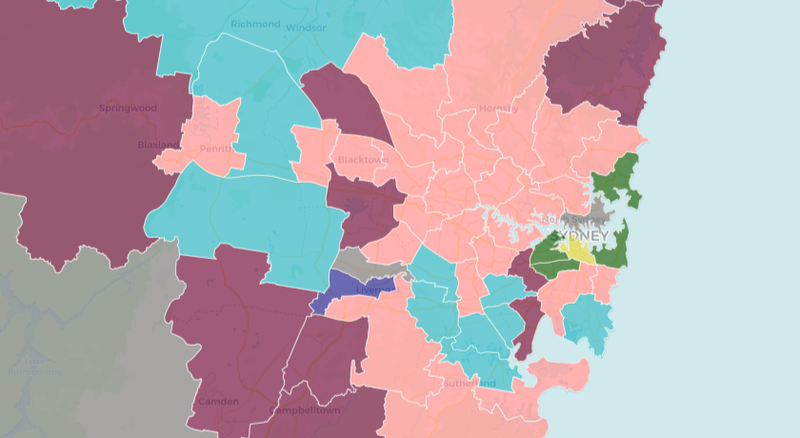 But there is a belt of seats in southern Sydney where Labor lost ground. This includes the key Liberal marginals of East Hills and Oatley, and the marginal Labor seat of Kogarah. It also includes Michael Daley’s seat of Maroubra. There were tiny swings against Labor in Canterbury and Bankstown. Labor also gained small swings in a number of regional but the Nationals significantly strengthened their hold in Monaro and Tweed. Secondly I’ve pulled together maps showing the primary vote for two parties in their lower house races: the Shooters and Keep Sydney Open. The map below shows KSO, and can be toggled to show SFF. I know there are others but I thought I’d pick a small sample. Due to sitting member factors Kogarah and Oatley had sub-par swings to the Liberals in 2011 and these seem to have taken two elections to wash out of the system. In 2015 Oatley also swung to the Liberals reflecting its double sophomore surge and Kogarah had a very below average swing to the ALP as the very popular sitting member retired. East Hills is a complete mystery. Perhaps it is demographic factors at work as its a traditionally working class area adjoining the much richer St George district? Perhaps some of the scuttlebutt about the ALP candidate stuck. Probably many more people had actually heard about the allegations this time as the trial of the former Liberal member’s campaign manager was widely reported.